This week our studies are focused on the theme: Reduce, Reuse, Recycle! The kiddos have really been enjoying the activities. Besides Earth Day themes, I threw in a few splashes of Spring. It finally arriving here where we live. All three kiddos have weak hand and arm muscles and are in OT because of this, (and several other things). Dinomite knows how to write all of his capital and lower case letters. Bulldozer and Princess, not so much. (Although Princess can write a lot of her upper case letters.) I love how working with play-dough helps them strengthen these muscles and helps them learn things like letters and such at the same time. Our letter of the week is R.
Source: I created this printable. One of the kiddos favorite circle time songs is "Days of the Week." Not only do we sing the song, but we watch a little music video as we do it to help with the kiddos need for visual cues and learning. We also review them as we do calendar every day. My hope is that all three kiddos can put the words in order along with numbers by the end of the week. The abbreviations are for Dinomite, as he's ready to be introduced to them. Source: I was an inspired by an activity I saw online, however it was a writing assignment, not a match up. The activity printable is actually two activities in one. There is no way Princess and Bulldozer are going to understand all the rules of suffixes, so for them this is just a simple singular/plural match up activity. They're enhancing their vocabulary and observing what letters are different etc. Princess really liked it today. Dinomite will separate the matched cards according to rule and ending. My hope is as he studies the letters of the cards, he'll start to feel more confident with the concept and then we can work on writing etc. Source: I created these cards. The kids have been begging for a coloring activity for a couple weeks now, so they were thrilled to see this activity on the shelves. Dinomite chose it first thing and was thanking me endlessly for a chance to color. Source: I found this activity as part of a free Earth Day Packet at Royal Baloo. This activity includes 3 blue recycling bins along with several addition problems you sort into the bins. Another one of Dinomite's IHIP goals is to learn his addition and subtraction facts. He seems to do really well with addition and likes it. Princess is actually enjoying them too. As long as she has the counters, she can get the answers correct. Its' not going to be long before she starts memorizing them. Dinomite is just starting to feel confident and comfortable with his subtraction facts. Hopefully with more practice he'll have them by the end of the year as planned. It's been a while since we've had a scissors and glue activity. Princess did fabulous with it today, not needing any help to cut, sort the pictures, or anything. It's amazing all she's capable of at only 3 years old. This week I wanted to find a way to really teach the kids the difference between reducing, reusing and recycling, so I designed a sorting activity (with some pretty cool pictures) I might add to help them out. Dinomite chose it first thing off the shelves! I was very excited. Bulldozer joined us as we went through it for the first time. There are some item cards that could be used for more than one category, if you really wanted to get technical, but for preschoolers and one in kindergarten, they worked great! Wednesday is my grandparents' 65th wedding anniversary. The entire extended family is going out to dinner with them to celebrate. Since we live quite far from most relatives and it's very difficult to attend any big events with the boys' autism and food allergies, the kiddos really don't know many people in their extended family. We're attempting this event because it's fairly short and simple. We're all sitting in one place for a short time, and then we're done. The restaurant offers allergy friendly choices for the kids, and I've received permission from the restaurant to bring food for Dinomite since he won't eat but his very few sensory friendly foods. We're continually going through the plan of events at every meal (where they're captive), in hopes that they'll remember how it will all go, and at least help ease some anxieties leading up to the event. We've talked about smells and noises etc. However, it's the people that's our biggest concern. I made this activity a few weeks ago, and brought it out again this week, just focusing on my side of the family. Hopefully they'll each go through the activity at least a couple of times before Wednesday, so they'll not be as nervous about the people around them. Bulldozer has been asking for a sensory bin. It took a while to come up with this idea, but I LOVE how it turned out. One may not be able to tell the contents of the bin from the picture, so I'll elaborate. I'd love to add a few more items, but I just haven't come up with any I like yet. The kids love it just the way it is, especially with the addition of the baby food jar and water bottle. They poured and stuffed and shook,etc. It was great! And the textures... with all the different types of paper products, there are so many things to feel. We started composting last year, not in the way one might think, but a very simplified version with one purpose. There are a few wood chucks that live in the area. They love our flowers, previous gardens (we don't even try to have one anymore), and garbage. It has been 6 years since we moved here and there's really no way to get rid of them. There are several of them all up and down the street. Last year, after trying so many other ideas, I decided I'd try to befriend the animals, in hopes that they'd leave my flower beds alone. We dumped our compost safe items in a destroyed bed of flowers on a daily basis. Sure enough, they loved them AND left my flowers alone. The kids have named the wood chucks and they really have become part of the family, as they come out to eat about the same time we eat dinner. So, thanks to the wood chucks, our kids have learned about compost! I couldn't resist adding a food sorting activity to help them learn what's okay and what's not okay to compost. We celebrated Earth Day today by leaving our first compost for the wood chucks this year. I'm sure they'll be happy as always. In keeping with our them this week, I wanted to teach the kiddos a practical life skill that would help them help the environment. We don't have a clothes line as we live in the right part of the city where clothes would be stolen, if we did hang them up. The kids had such a fun time trying to hang up clothes. Dinomite even went as far as learning how to fold them up when he took them down and placed them back in the basket. Bulldozer was so proud of his work, he showed his OT when she showed up. I used newborn sized clothing so it would be easy for the kiddos to manipulate, including items: pants, shorts, shirt, jacket, dress, and socks. I've been saving this activity for Spring, and couldn't resist adding it this week. I used purple water in the dropper, especially for Bulldozer. His favorite color is purple to the point of obsession. Yet another Spring activity, I couldn't resist. Actually the flowers were decorations for Sunshine's adoption party last weekend. Again, with flowers, because of the season. We just had snow fall here on Saturday, so I guess you could say I'm really trying to bring on Spring, if not outside, than at least in our minds. As the year is coming to an end, I've noticed we're running short on pencils. Since the kiddos love sharpening them so much, I figured I'd give them the task of preparing them for use. Our art project for the week is this beautiful palm print Earth, surrounded by finger print people. I love how it incorporates so many things. The kids will receive some sensory input as they paint their palms and fingers the proper colors, in preparation for leaving prints on the paper. They'll mix paint as they select specific colors they want for their finger people. Then, once all has dried, they are able to draw hair, faces, etc. on their fingerprint people. I can't wait to see how they turn out. Source: I found this porject at Meet the Dubiens. The kiddos are always begging me to use the musical instruments, so I figured I'd give them some free time with them this week. Our last project for the week, we actually did today. The kids decorated recycling bins for our back porch. We have always recycled, it just hasn't been as organized as I'd like it. As I've been sorting and getting rid of bins of clothes in our attic, there just happen to be three empty bins available for use. SCORE! I thought about the kids painting and really beautifying the bins, but knowing they'll be on the porch and it snows here at least 50% of the year, I figured crayons would be my best bet. They LOVED the activity. Even Sunshine, almost 18 months joined in with her own bin. Dinomite's bin. I am so impressed with his art work! Next week we continue our Earth Unit, learning about endangered species. I'm super excited! What a great study! 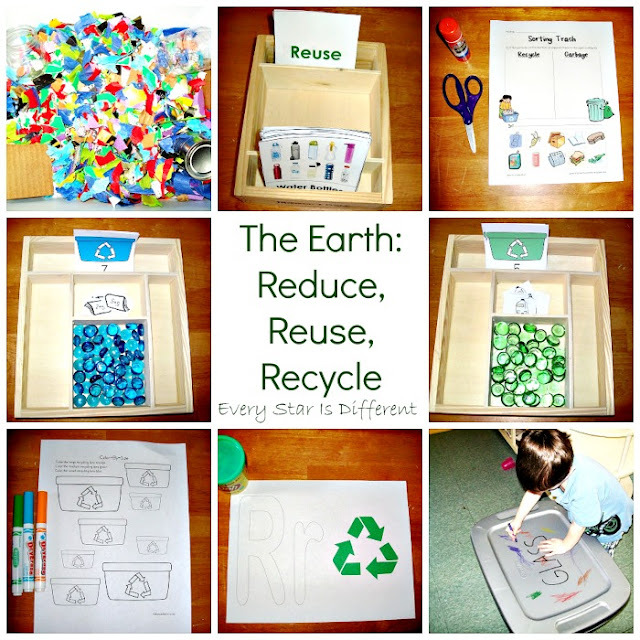 So many fun ways to learn & explore about recycling! Thank you so much for your kind words! They mean a lot coming from someone who has so much experienced and expertise. You have made my day! Such great resource! Would you happen to have the link for the cards you made for Reduce Reuse Recycle activity? Thanks!